The tastes and point of view of internet users across the world often vary. This is one of the reasons why impressing them may be quite a daunting task. As a result of this, companies nowadays prefer to have a custom website design on their website. This ensures that they are able to create stunning designs that will capture the attention of users, and, at the same time, impress them. With a custom website design, you will be offered a combination of content and design that favors and depicts the unique identity of your brand or business. Custom website design offers you an opportunity to combine what you like. You have the opportunity to design based on the needs of your company design which perfectly fits into your own criteria. You run it your way so as to attract customers. However, you should see developing a custom website design for your brand or business as a smart investment, and not as an expense. The mains aim is to help in the growth and development of your brand or business. Let us take a look at some of the benefits of designing a custom web design. How do you distinguish your brand from others and give it a unique name online? To achieve this, you need more than just a combination of logos. It is more than just fitting your brand or business into template placeholders. However, your aim should be building an exclusive identity that showcases the sophistication and uniqueness of your brand or business. This is what a custom web design offer you. The attractiveness of your website is one of the things that help sell your business. Custom web design offers you a unique appearance that depicts the identity of your brand. It should be more than just designing a website. Your aim is to design it in such a way whereby your products, contents, and services are properly arranged and well-structured. This is vital for a quality website. Designs and contents ought to be flawlessly aligned on the website. The best way to achieve a properly arranged and well-structured website is by opting for custom web design. A structured website helps to increase user engagement on your website. The success of your business is largely dependent on how well you are able to impress your customers. If not for them, you may not be in business anymore. This is why you have to try as much as possible to look for ways in which you can keep attracting more and more customers. This is what you get with a custom web design. A custom web design can help transform your business needs and goals. Not only that, it can also build an ideal flow, and structure that will offer outstanding user experience. This will help your customers get engaged with your website, complete a form, reach the call to action to make a purchase, or pick up the phone to know more about your business. Competition is good for business. Rather than just relaxing, you are offered the opportunity to dig deep into your creative instincts and come up with ways you can surpass your rivals. Custom web design offers you a step ahead of the competition. When there is competition, you will be at your very best. You will be ready to look for ways to excel your business a step further. With a custom web design, you can build a quality presence around your business. You can do this in such a way that projects the image of your business to your customers. At the end of the day, this will help your business stand out ahead of the competition. There you have it! All these are some of the benefits of making a custom web design. webVDEO is always ready to create a custom web design that will get your audience and customers engaged. 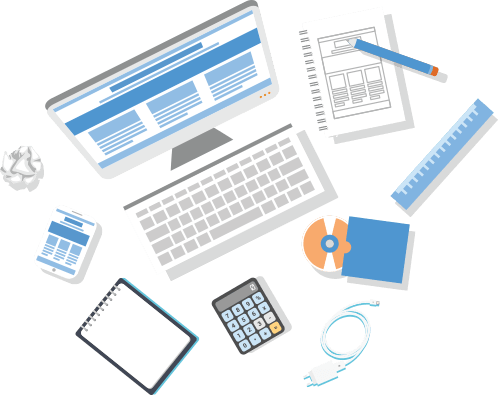 Our team of expert web designers are available to design a highly fascinating and attractive website that will definitely get visitors to your website fascinated, encouraging them to patronize your product and services. At the end of the day, you are guaranteed to get more customers.